Bishop's weed, a.k.a. ground elder, herb gerard, goutweed or gout wort is a perennial plant in the carrot family (Apiaceae) that grows in shady places. 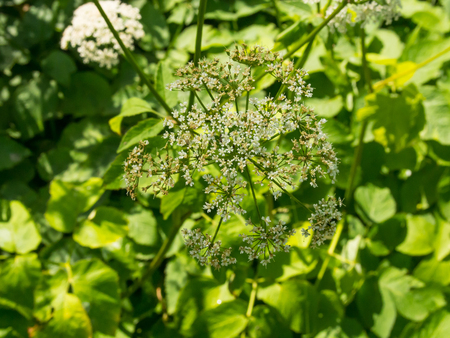 The name "ground elder" comes from the superficial similarity of its leaves and flowers to those of elder (Sambucus), which is unrelated. It is the type species of the genus Aegopodium. This species is native to Eurasia, and has been introduced around the world as an ornamental plant, where it occasionally poses an ecological threat as an invasive exotic plant.